YouTube Tips For Success // How To Be Successful On YouTube and How To Grow A Successful YouTube Channel — 2 very common questions for YouTubers. 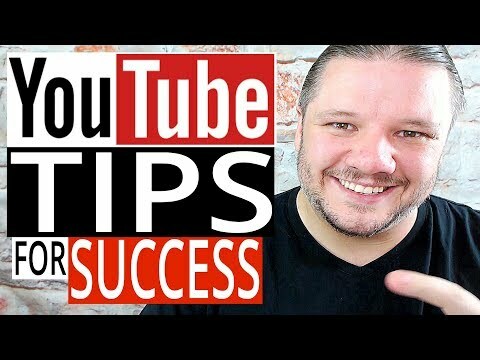 YouTube Tips and Tricks for YouTube Success are hard to come by and for small YouTubers tips for YouTube can be confusing and often contradictory. Here are my 6 YouTube Tips for Success on YouTube in 2018. PICK YOUR NICHE — A powerful tips for success on YouTube is knowing what you want to make videos about and then doubling down into that category. Get detailed, get nerdy, get to the fine detail. CONSISTENCY — To grow a successful YouTube channel you need to keep showing up same bat time, same bat channel over and over and over and over until people get used to seeing you and your content. Pick set days, pick a video style and STICK WITH IT. HELP PEOPLE — YouTube success can be linked to how loyal your viewers and subscribers are. The best way to build that loyalty in a new audience is by HELPING them with their issues. Ask them questions make How To videos and watch how quickly people trust you. PLAN FOR YOUTUBE SUCCESS OFF YOUTUBE — Look into non YouTube based income. You should not solely rely on the YouTube partnership Program and Adsense. YouTube Ads do not pay enough to support a growing YouTube channel and so you need to think of extra income sources. Maybe offer your skills to other YouTubers in coaching, singing lessons etc. Consider affiliate links, sponsorship’s or selling merch. PATIENCE IS A YOUTUBE TIP FOR SUCCESS — YouTube is a long haul game that not many people have the patience to play. You will have to be on YouTube for months and years to help you build the skills you need to grow on YouTube. If you want to make YouTube your living wage then you need to dedicate yourself to the idea that you will need to aim for the future and learn the YouTube Tips For Success slowly over time. HAVE FUN — YouTube is a hobby and YouTube should be something you want to do because you like it, not just because you want to be famous or rich. My ultimate YouTube Tip for Success is to start a YouTube channel, put out the videos you like and enjoy the ride.